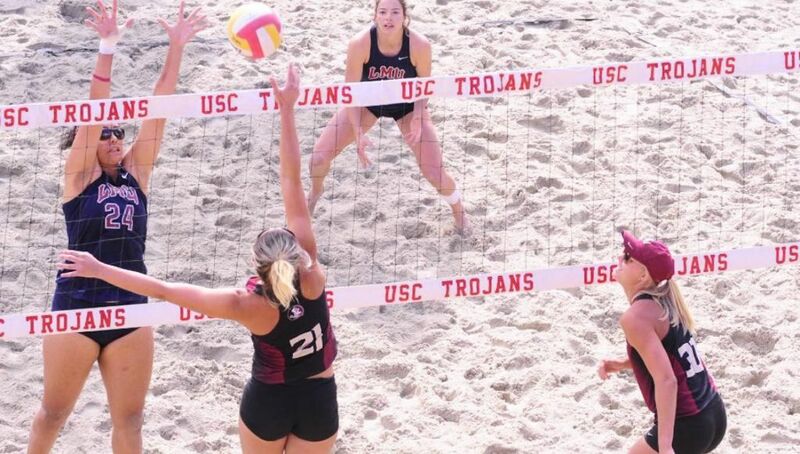 SIESTA KEY, Fla. – The Florida State Beach Volleyball team recorded two wins on Saturday at the 7th annual Fiesta on Siesta Tournament as the Seminoles (18-1) defeated Louisiana-Monroe, 5-0, before closing out the day with a 3-2 victory over No. 17 North Florida. The Seminoles began the day with a convincing win over ULM winning in straight sets on all five courts. The pairs of Macy Jerger and Nikki Esposito and Kayla Joyce and Annie Montgomery got the Noles off to a fast start winning on courts four and five. Vanessa Freire and Sierra Sanchez clinched the team victory with a win on court three downing the Warhawks’ Delaney Driver/Kaitlyn Shearer, 21-14, 22-20. Jace Pardon and Julie Brown and Kristina Pellitteri and Victoria Paranagua put the finishing touches on the clean sweep with wins on courts one and two, respectively. In the second match of the afternoon, Florida State pulled out a hard fought victory over UNF. The Noles found themselves in an early deficit as the duo of Jerger/Esposito had to retire prior to the start of the second set due to an injury on court five. The lead was short lived as Joyce/Montgomery evened the match at 1-1 with a three-set victory on court four. After dropping the first set to UNF’s Ambre Desaulnay/Chaney Howard 21-11, Joyce/Montgomery bounced back to win the next two – 21-12, 15-7. Paranagua/Pellitteri gave the Noles a 2-1 lead with a straight set victory on court two (21-15, 21-17), but the Ospreys answered right back with a straight set victory of their own on court three to tie the match once again as Katarina Raicevic/Courtney Miller defeated Vanessa Freire/Sierra Sanchez, 23-21, 21-13. Brown/Pardon clinched the match for the Seminoles with a straight set victory on court one as the duo defeated Jessalyn Kinlaw/Megan Shaw, 21-19, 21-18. It was an all-FSU final in the pairs’ bracket play tournament as Brooke Kuhlman and Katie Horton defeated fellow teammates Milica Kubura and Cecilie Woie, 21-16. The Seminoles featured five total pairs teams in the tournament as Kuhlman/Horton and Kubura/Woie were joined by Meghan Conway/Ali Eager, Katherine Plessy/Blyss Harkness and Julia Thompson/Breana Edwards. Florida State returns to action on Sunday, April 10 with two more matches at the Fiesta on Siesta Tournament. The Seminoles will face No. 20 Florida Atlantic at 10:30 a.m. before closing out the tournament against UNC Wilmington at 11:30 a.m. Match 18 – Siesta Key, Fla. Match 19 – Siesta Key, Fla.